In this video we will learn about, INSTEAD OF UPDATE trigger. An INSTEAD OF UPDATE triggers gets fired instead of an update event, on a table or a view. For example, let's say we have, an INSTEAD OF UPDATE trigger on a view or a table, and then when you try to update a row with in that view or table, instead of the UPDATE, the trigger gets fired automatically. INSTEAD OF UPDATE TRIGGERS, are of immense help, to correctly update a view, that is based on multiple tables. Now, let's try to update the view, in such a way that, it affects, both the underlying tables, and see, if we get the same error. The following UPDATE statement changes Name column from tblEmployee and DeptName column from tblDepartment. So, when we execute this query, we get the same error. Now, let's try to change, just the department of John from HR to IT. The following UPDATE query, affects only one table, tblDepartment. So, the query should succeed. But, before executing the query, please note that, employees JOHN and BEN are in HR department. 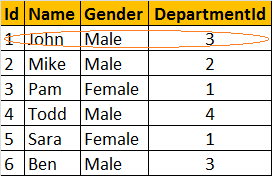 After executing the query, select the data from the view, and notice that BEN's DeptName is also changed to IT. We intended to just change JOHN's DeptName. So, the UPDATE didn't work as expected. This is because, the UPDATE query, updated the DeptName from HR to IT, in tblDepartment table. For the UPDATE to work correctly, we should change the DeptId of JOHN from 3 to 1. So, the conclusion is that, if a view is based on multiple tables, and if you update the view, the UPDATE may not always work as expected. To correctly update the underlying base tables, thru a view, INSTEAD OF UPDATE TRIGGER can be used. Before, we create the trigger, let's update the DeptName to HR for record with Id = 3. Now, let's try to update JOHN's Department to IT. The UPDATE query works as expected. 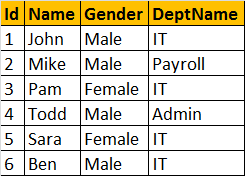 The INSTEAD OF UPDATE trigger, correctly updates, JOHN's DepartmentId to 1, in tblEmployee table. Update() function used in the trigger, returns true, even if you update with the same value. For this reason, I recomend to compare values between inserted and deleted tables, rather than relying on Update() function. The Update() function does not operate on a per row basis, but across all rows.